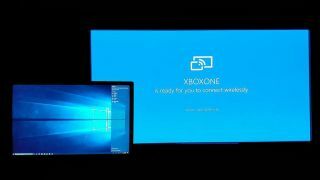 Thanks to a new update for Microsoft's old 'Connect on Windows' application, it's now possible for PC gamers to wirelessly cast their entire game library (yes, that includes Steam) to an Xbox One console connected to the same Wi-Fi network. The app, now titled Wireless Display, previously only allowed users to cast content from their PCs and Android devices to Microsoft's Surface Hub and other Windows computers. That functionality has now been expanded, giving PC gamers the ability to project their games to their living room television via an Xbox One console. As reported by Engadget, the Wireless Display app offers numerous latency settings, including one specifically for gaming which will hopefully minimize lag while game casting. To start casting PC games (or anything else on your computer for that matter) to your Xbox One, you must first download the Wireless Display app from the Microsoft Store and install it on both your Windows 10 machine and console. Full Xbox One controller support is available while game casting, however, mouse and keyboard support is not supported, at least for the time being. Hopefully, that functionality will arrive at a later date.